20% off all sunglasses including Oakley, Ray-Ban, Gucci, Prada and more! Get a 90-day payment option with Acima Credit. No credit needed. We’ve moved to a new, bigger location to better serve you. New Eyewear & Sunglasses Styles Added! Ray-Ban, Dolce & Gabbana, Oakley, Tiffany & Co.
Eyecare Leaders offers its patients the professionalism of a premium eye care provider with more than 30 years of experience. Cutting-edge tools, attention to detail, advice and courtesy are our added values. In our work we put you and our passion first. Come and visit us any of our offices to discover the services we offer! Your vision plays a vital role in your life each and every day, which is why it is so important to take the right steps for maintaining good eye health. We provide a variety of services, from general exams to corrective surgery. To ensure the most comprehensive eye exam, our offices are equipped with the latest tools and machines. Comprehensive eye exams can detect more than poor vision, it can also shed early light on painless diseases like glaucoma, macular degeneration, cataracts, and diabetes. With over 30 brands to choose from, you are sure to find the perfect frames for all tastes and budgets: from up-and-coming to renowned brands such as Ray Ban, Jimmy Choo, Kio Yamato, Tiffany & Co., Silhouette and many others! "I love their service, always very thorough and very knowledgeable. Christina has always been very professional. She has so much patience and knows her patients needs. She knows my style and is always ready to be honest with the frame you pick. She will tell you if this is right for you and will give you good advice on what she thinks is better for you. I recommend this location and the Doctor to all my friends and family." "I have been going to this location for over 10 years. The customer service is unmatched and they always take care of their patrons and make sure to inform you of your current conditions with your eyes and make the appropriate recommendations." To Wear or Not To Wear: What Happens If I Don’t Use My Glasses? Without proper visual correction aids, it would be hard to read, to move around, to observe the world and to be on the lookout for danger. Glasses, for these cases, are lifesavers. So, what if I opt to not use my glasses at all? The medical term conjunctivitis literally means “inflammation of the conjunctiva.” Known more commonly as “pink eye”, it is synonymous with sore eyes. It is considered to be the most common form of eye condition for all age groups, and oftentimes when it occurs it is only a mild infection. Great news! We’ve added more brands to our already extensive line-up including Oakley, Chesterfield, Michael Kors and Coach. Additionally, the latest styles from Ray-Ban, Tiffany & Co., Oakley, Ferragamo, Gucci and Silhouette are available in our offices. Get a sneak peek at what’s new. Here you can find frames for all tastes and budgets: from renowned to up-and-coming brands. 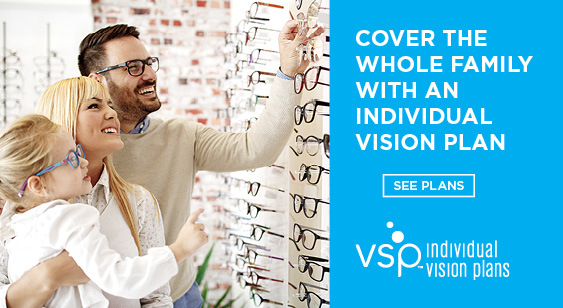 Get individual vision insurance via VSP for as low as $13 per month.